PopsLife Ep. 2 - "Main Event"
A typical birthday Saturday for us...Main Event, games, and beats! We had a blast kicking it all day. Jumped up early Saturday morning and let the kids mess around on iMaschine, Beatmaker 3, and the iPad. Headed off to a bday party for a few hours and then came home to finalize the track. The video towards the end shows a bit of the process as well so watch all the way through. Stay tuned for the breakdown versions of the beats and editing via mobile coming soon. Enjoy! As many of you know that follow my channels, I'm past the point of making music on a mobile situation. I'm all in. I've figured out a way to replicate my desktop situation-minus Ableton, Maschine, etc, but with other programs and processes. The workflow is a challenge, but I'm constantly looking for ways to tweak. I wanted to share something I do via desktop (work primarily with audio) with you guys to show you how much can be accomplished. Check the video below and peep the steps I've left you if this could potentially help. Comment on the video if this was useful. Peace! 1. 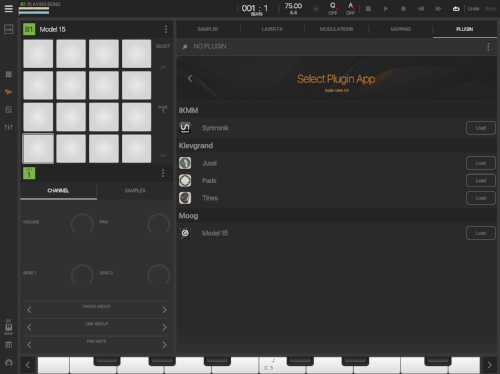 Add a new bank, insert your favorite synth plugin that you'd like to record audio from on pad 1. 2. Add an audio track. In the mixer section, tell the new audio track to receive it's "Internal Input" from Pad 1 of the bank you created. In this case, it would be Model 15 for me. 3. Record set your record "arm" on the audio track and record audio on to that track with it selected in the arranger. You may not see audio levels jumping until you're done recording. If you'd like to monitor prior, just set that in your preferences. *Pro tip* In my video you'll hear the audio off time just a bit at the 1. I did that for video purposes so excuse the mistake. Normally, you'd want to leave a bar in front of where you'd like to start recording. This would alleviate any latency issues. PopsLife Ep. 1 - "Crusing"
Ive been mad inspired by my guys lately Justen Williams, Cameone, and Henny on some of their video/blog/vlog/beats type work I wanted to get going on something I'd considered for a while--showing a bit more of the "the process." Alot more goes into music than most think that actually involves life. I draw inspiration from life in general so I'd like show that--alongside of actual beatmaking and such. Popslife is here to inspire, encourage, and to show some of that. I've challenge myself to do it all on mobile. The beats will be created on the iPad Pro. Videos shot on the Sony X3000. I'll try to do the editing mostly in Lumafusion for iPad Pro as well. Most has taken place via Final Cut for the first one just so I could get an idea of what type of workflow would be needed. I'll pair the PopsLife video with the beatmaking part of it to follow. For now, enjoy! Samples Landing - Mya "Phya"
This one here is interesting. While in the early stages of MSXII Sound Design, everything we offered was "royalty-free", meaning, we had no share in anything that went on beyond the initial sale/download of our samples. Our Soulful Stems project, one of the best ever, ended up on this Mya record. It's from a composition called "Irrefutable" that ended becoming her "Phya" record. Funny thing is...this record was Grammy Nominated last year. Yup, no claim or anything on this. So technically ya boy is....well, I'll let you figure that out. Cool story indeed, but things have since been changed! Haha. An idea from 2015 is finally able to surface! RacksforLive is an MSXII extension focusing on top notch Ableton instruments, racks, presets, fx, expansions, tutorials, and more. Check it out and get familiar! We were finally able to get that plugin for iOS completed. Lo-Fly Dirt is our first offering on the platform via MSXII. I'm incredibly proud of this and couldnt be more pleased with it's response on the market. I've gone to 80% mobile solution when producing music on my own and I'll be showing that more here this year. I needed to bring some tools I feel are useful for the platform so that's what we did. Lo-Fly Dirt is amazing. You should snag it now in the App Store! Download Lo-Fly Dirt in the App Store. Wanted to share a few keys I use when working on stuff. It really doesn't take a whole lot to get things going. Here, we're using nothing but stock stuff within Maschine to accomplish a pretty cool technique that can add a lot of flavor to your sound. Also, I'm definitely digging the new Maschine MK3. Really feel like this is an upgrade from my previous MK2. Enjoy! Recently linked up with the homie Henny of Tha Bizness and he was cool enough to showcase the new plugin we've been working on in his DOPE series, Adventures In Beatmaking. I've been quietly working on a ton, but iOS music production has been at the forefront of alot of it. Naturally, I reached out to Henny as he's been a spark for alot of us looking into mobile solutions for music. Peep the video below, follow his series on Youtube, and stay all the way posted for Lo-Fly Dirt via MSXII Sound Design coming to that App Store shortly.